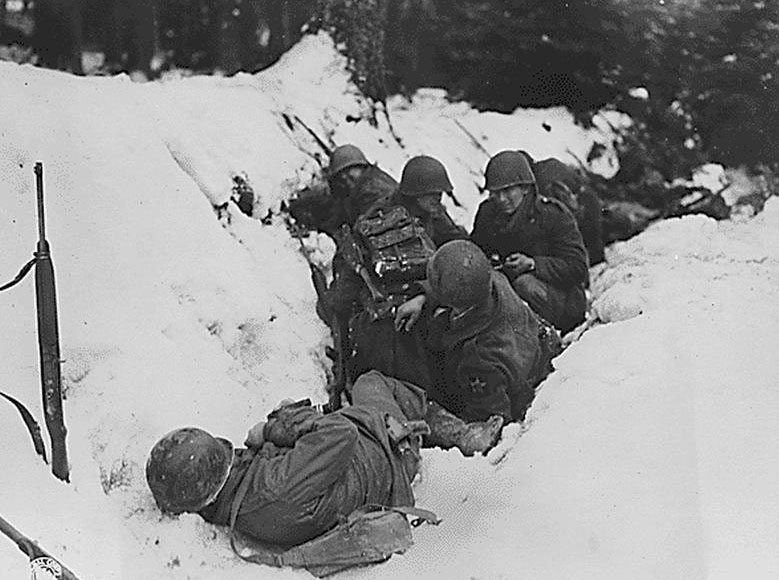 The Battle of Elsenborn Ridge, fought on the Battle of the Bulge’s Northern Shoulder from 16-23 December 1944 would pit the U.S. V Corps against the 1st SS Panzer Corps and 67th Corps. The battle would determine the course of the larger Ardennes offensive and would eventually play havoc with the Sixth Panzer Army’s time table. It would also be the baptism of fire for the novice 99th Infantry Division and would see the new US artillery proximity fuses tested with devastating effects on German forces. Planning for the German attack, deceptively code-named, Wacht am Rhein (Watch on the Rhine) had been taking place since early September of 1944. Three armies: the Sixth Panzer, the Fifth Panzer and the Seventh would attack in the early hours of 16 December 1944. The main effort would come from Oberstgrueppenfuehrer der Waffen SS Josef “Sepp” Dietrich’s Sixth Panzer Army which was composed of the 1st and 2nd SS Panzer Corps and the 67th Corps. The 1st SS Corps was commanded by SS Grueppenfuehrer Hermann Priess and consisted of the 1st SS Panzer Division (Leibstandarte SS Adolf Hitler), the 3rd Parachute Division, the 12th SS Panzer Division (Hitler Jugend) the 12th Volksgrenadier Division, the 277th Volksgrenadier Division and Oberstuermbannfuehrer Otto Skorzeny’s 150th Panzer Brigade. Dietrich had in all four SS Panzer divisions, 800 tanks and assault guns, 1000 artillery pieces and rockets at his disposal. 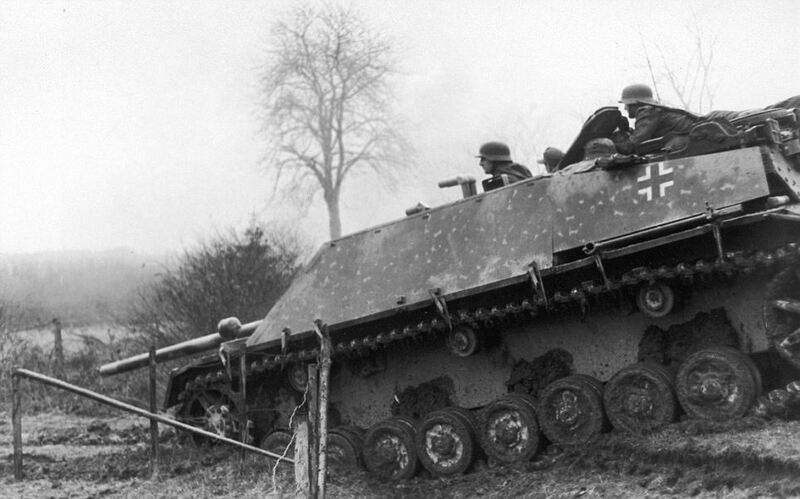 The Sixth Panzer Army was ordered to attack along a front ranging from Monschau in the north to Krewinkel in the south. With orders to cross the Meuse River, the Sixth Panzer Army would eventually swing south of Liege, aim for Antwerp, while securing its right flank north of the Albert Canal. Leading the attack against the US V Corps would be three infantry divisions, the 326th Volksgrenadier, the 277th Volksgrenadier and the 12th Volksgrenadier. The Volksgrenadier divisions were comprised of veterans recuperating from wounds suffered on the Eastern Front and those previously unfit for military service. Both the 277th and the 12th Volksgrenadier Divisions were at 70% strength. Once the infantry divisions had established penetrations, the two lead SS Panzer Divisions, the 1st SS and the 12th SS would break through, with the 12th SS near the twin villages (Krinkelt-Rocherath) and the 1st SS, just north of the Losheim Gap. 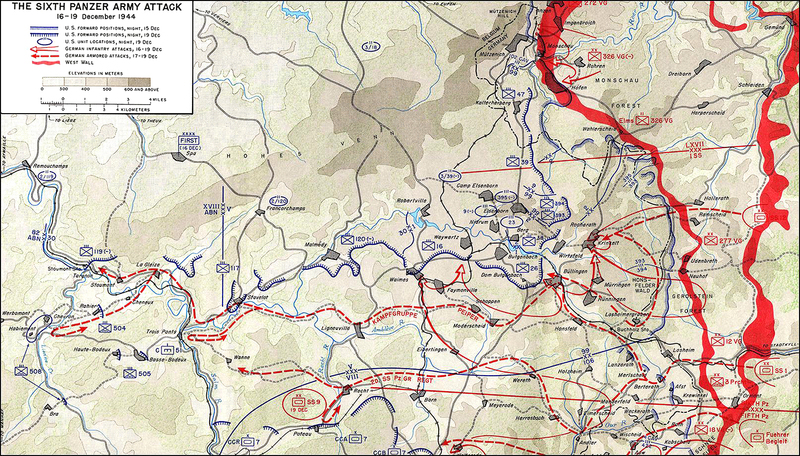 General Priess wanted to put the weight of his panzer exploitation in the south, but the Elsenborn Ridge area had to be secured if his forces were to utilize the five main roads or rollbahns leading from the German border to the Meuse. The Elsenborn Ridge stood 2,000 feet high, and extended for over three miles north to south and a mile and a half east to west. The Germans knew V Corps artillery units were on the ridge. Failure to secure the twin villages and Elsenborn Ridge would mean that no German units could travel on Rollbahns A-C without being interdicted by indirect fire. Dietrich had argued with Field Marshal Model about the inexperienced volksgrenadier divisions leading the assault. He felt that the veteran 1st and 2nd SS Panzer Divisions should spearhead the attack. German intelligence indicated that only one division, the novice 99th, was in front of the 1st SS Corps’ axis of advance. The secret move of the 2nd Infantry Division from its positions in the Losheim Gap toward Wahlerscheid had not been detected. Dietrich was over-ruled and Model’s decision would have future consequences for the whole operation in general. Even more vital to the German attack than the road networks, was the weather. The attack would only have the element of surprise if there was “Hitler Weather”; fog mixed with snow and rain, causing allied aircraft to be grounded. 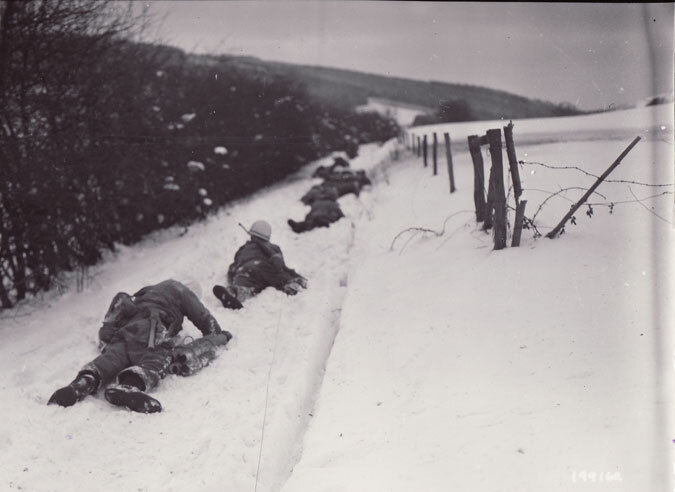 The weather during 15-16 December 1944 was cold with temperatures ranging from 35-10 degrees. The ground was hard and it was covered with snow and ice. Snow fell sporadically. Skies were grey and fog and mist clung to the tops of the thick pine trees. Dawn arrived at 0835 and dusk came at 1630. To the average U.S. soldier on the eve of Wacht am Rhein, the German Army, while still a tough foe, was a beaten force. This belief wafted all the way from the private sitting in a foxhole to Eisenhower and his staff at SHAEF (Supreme Headquarters Allied Expeditionary Force). For two months, Allied intelligence officers had accumulated a morass of information concerning everything from German rail movements to requests for aerial reconnaissance of the Meuse bridges to Wehrmacht defectors who claimed an attack was imminent. 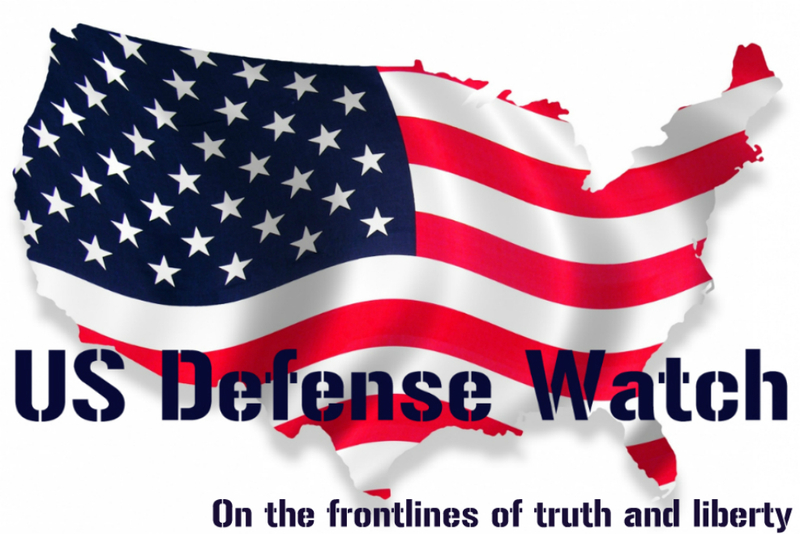 Most intelligence officers from SHAEF down to battalion level ignored the myriad of evidence. They felt the Germans could never launch a major offensive and only had the capability to conduct local attacks, while preparing to defend along the Rhine and in the Ruhr pocket. The first unit to face the German onslaught would be the 99th Infantry Division, commanded by Major General Walter Lauer. The 99th had entered the line in early November, 1944. Knowing his unit lacked any combat experience, Lauer had ordered constant patrolling to be done in the division’s sector which, except for the town of Hoefen, extended through dense coniferous forests. The division sector covered 19 miles from Hoefen to the railroad just north of Lanzerath. To the east of the sector was the Siegfried Line. The woods in the 99th sector were filled with gorges and streams. The sector lacked roads inside the forest belts. The division was over-extended and relied on a serious of platoon strongpoints to defend against any enemy probe. The division was covering an area two times larger than standard doctrine suggested and three battalions from the 99th; the 2/393rd, the 1st/395th and the 2/395th had been siphoned off by V Corps and attached to the 2nd Division to support their attack on Wahlerscheid on 13 December. The dispositions of the 99th were: the 395th Infantry was in the north, the 393rd in the center and the 394th in the south. Cold weather injuries had also diluted combat strength. The Battle of Elsenborn Ridge commenced at 0530 hours on the morning of 16 December. A tremendous bombardment of heavy artillery and Nebelwerfer rockets boomed across the 99th Division front. At first, the troops believed it was outgoing mail or friendly artillery fire, but those thoughts were soon erased by the thousands of artillery rounds saturating the area. The tree bursts did minimal damage as the 99th positions were well displaced and the troops had more than adequate cover above their foxholes. The thunderous artillery barrage coincided with artificial light that provided illumination for the attacking infantry. The immediate American belief was that the artillery was in preparation for a local counter-attack to halt the 2nd Division’s drive toward the Roer River dams. The initial German infantry attacks were slow-going as the volksgrenadiers had to negotiate a series of minefields and barbed wire obstacles. In the north, the 3rd Battalion,395th and elements of the 102nd Cavalry Group checked an attack by three battalions from the highly depleted 326th Volksgrenadier Division. The 326th only consisted of four battalions and the failure of another division to arrive from the Roer River area led to the failed attack. The 3rd Battalion casualties were very light as compared to the Germans who lost one fifth of the division during the attacks. Proximity fuses were first used by the 405th Field Artillery Group. It was the first time the deadly new weapon had been utilized in the ETO (European Theater of Operations). Instead of exploding on contact with the ground, the new fuses detonated in the air, with devastating results. The 1st SS Panzer Corps was pushing hard in the center with its lead element, the 277th Volksgrenadier Division. The German attacks pressed through the forest four miles due east of the twin villages. The initial artillery had lifted and the clambering volksgrenadiers had failed to take advantage of the cover from their own indirect fire. As the volksgrenadiers pressed through the woods, they were met by fierce resistance from the scattered strongpoints of Lieutenant-Colonel Jack Allen’s 3rd Battalion, 393rd Infantry. The 3rd Battalion’s positions were set on a ridge, in deep forest. But, there were scattered strongpoints which allowed for gigantic openings in the battalion’s flanks. By noon, General Priess was growing dismayed at the 277th attack. He ordered a battalion of SS panzer grenadiers from the 12th SS to regain the momentum. The SS grenadiers were able to infiltrate down the deep cut where a small creek ran, which enabled them to cut off 3rd Battalion’s route back to the rear. But, the SS troops were unable to make any more progress that day. By dusk, the Germans and Americans were both reorganizing after each side sustained over 300 casualties. The 3rd Battalion was partially surrounded, but still holding. To the south, of 3rd Battalion, the 1st Battalion,393rd Infantry had also fought off attacks from the 277th Volksgrenadier. The 1st Battalion positions were arrayed in open ground, on the edge of the forest, paralleling the International Highway that ran from north to south. The open ground provided excellent fields of fire for the battalion. The fighting between the 1st Battalion and the 277th continued throughout the day, which included a company sized bayonet charge and hand to hand combat. The 1st Battalion had held, but at a terrible cost. The battalion had incurred more than 50% casualties. Like the 3rd Battalion, its situation was tenuous. The soldiers of the 99th Division had done well in their first major engagement. They had stopped any forward movement in the center from the 277th Volksgrenadier and the elite panzer grenadiers from the 12th SS. Dusk brought damp cold to the forest. Soldiers shivered in their foxholes eating cold rations and tending to the wounded. Meanwhile, the Germans continued to probe the forest for any gaps in the sector that they could use to finally open the way for the 12th SS. In the south, that morning, fusiliers from the 990th Regiment of the 277th Volksgrenadiers reached the 2nd Battalion,394th lines, but were stopped by small arms and indirect fire. The only avenue of approach toward the 2nd Battalion was through ravines and across firebreaks that were over-watched with machine guns and mortars. Because of terrain advantages, the 2nd Battalion,394th would fare better that day than the 393rd on its left flank. The other battalions of the 394th were in the direct path of the 12th Volksgrendier Division, which was intent on securing Rollbahn C that passed through the crossroads at Losheimergraben, and then west, southwest through Bullingen. At 0745 hours, the 3rd Battalion,394th was attacked at Buchholz Station by the 27th Fusilier Regiment. The fighting lasted until noon and the Germans were eventually repelled. In Losheimergraben, the 1st Battalion, 394th was hit by the 48th Grenadier Regiment. The fighting, like that at Buchholz Station was brutal. By mid-day, the 1st Battalion still controlled the Losheimergraben crossroads, but the battalion had to re-form its lines and suffered many casualties. The German attack against the 394th had also cut off any communication between the regiment and its organic I and R (Intelligence and Reconnaissance) platoon at Lanzerath. The 394th commander had no idea that his I&R platoon had fought off a battalion from the elite 3rd Parachute Division before eventually being over-run and captured. That afternoon, the V Corps commander, General Gerow, gave General Robertson permission to halt his attacks and remain in place with the rest of the 2nd Division’s two regiments, the 9th and 38th. The division was to plan for a withdrawal under fire. By nightfall on the 16th, the initiative had been lost by the Germans. General Lauer reported to General Gerow that the Germans had made no penetration in depth and that his front lines were stable, although he was worried about his southern flank. The efforts of the Sixth Panzer Army had failed across the Northern Shoulder. The three Volksgrenadier divisions had been expected to clear the path for the 12th and 1st SS Divisions by no later than 0700 on the morning of 16 December. Instead, the attack had stalled from Monschau in the north to Losheimergraben in the south. The 12th SS could not yet reach Rollbahn C through the twin villages. The 1st SS was poised to exploit the breakthroughs by the 3rd Parachute Division, but Rollbahn C was also blocked to the south by the 394th. That night, General Priess ordered General Kraas, the commander of the 12th SS Panzer to take charge of the operation and to penetrate the forest and seize the twin villages on 17 December. In the early morning hours of 17 December, the 395th Infantry had been ordered to pull back from the Wahlerscheid fight and move southwest towards Rocherath, where new positions were to be established, covering the roads leading northeast from Rocherath. The 2nd Division had been ordered to fall back and defend Krinkelt-Rocherath. The 1st SS Panzer Division was also on the move. The lead column, Kampfgruppe Peiper commanded by Obersturmbannführer Joachim Peiper, seized Honsfeld and opened Rollbahn D. Peiper’s column then swung northwest toward Bullingen, and ran into a hasty defense prepared by the 254th Engineer Battalion. The engineers fought off two attacks by 1st SS panzer grenadiers. They were soon joined by a platoon from the 644th Tank Destroyer Battalion. By 1000 hours, the engineers were only at half strength and with the remnants of the tank destroyer platoon, withdrew to higher ground, 1000 yards to the northwest, in order to block the road to Butgenbach. 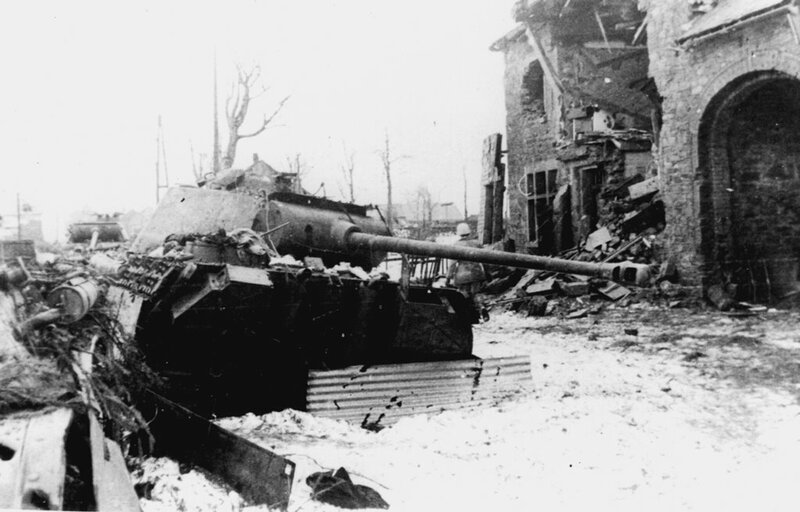 The presence of the 1st SS Panzer in Bullingen set off alarm bells at the 2nd Division CP. General Robertson ordered his only available reserve, the 3rd Battalion, 38th Infantry to move south through Krinkelt and establish a blocking position on the road leading north from Bullingen to Krinkelt. The rest of the 38th was to establish defensive positions in the twin villages. The 9th Infantry Regiment was to deploy south of Wirtzfeld, to defend the road leading into the village, which led to Elsenborn Ridge. General Robertson worried that he had not been given ample time to retreat from Wahlerscheid and that the 2nd and 99th Divisions would soon be surrounded. Strangely, the 1st SS did not move towards Wirtzfeld and the twin villages. Instead it swung southwest. If it would have moved north, it could have easily enveloped both American divisions. Peiper believed the 12th SS would soon seize the twin villages and therefore he could continue his move toward Malmedy. Also, US fighter-bombers had made a rare appearance in the inclement weather and had strafed several vehicles from Peiper’s convoy. This may have also caused him to continue southwest instead of swinging north. The Germans launched their most ferocious attack of the morning against the center of the 99th. The 277th Volksgrenadier had been reinforced by armor parceled out from the 12th SS. The 393rd held and launched a weak counter-attack at 0800 to restore its former positions. The attack fizzled out as more German infantry poured into the area. By 1030, Colonel Scott, the 393rd commander ordered a withdrawal to positions roughly 1.5 miles northeast of Rocherath. This included Charles MacDonald’s 3rd Battalion, 23rd Infantry. The 3rd Battalion, 23rd Infantry and the 1st and 3rd Battalions, 393rd Infantry were under attack from two battalions of SS panzer grenadiers and a battalion of tanks from the 12th SS. All three regiments were in contact with the enemy from morning to the late afternoon. On the north-east edge of Rocherath, Lieutenant-Colonel William McKinley, grand- nephew of the former president, and commander of the 1st Battalion, 9th Infantry was ordered to place his battalion in a blocking position along the road leading from the forest directly into the northeast corner of Rocherath. By nightfall, the scene around the twin villages was utter chaos, as units redeployed under fire. Early that evening, the fog was so heavy that an enemy platoon reinforced with three tanks made it past McKinley’s position and headed into Rocherath. Two tanks hit mines, while the other was destroyed by a bazooka. An hour later, McKinley’s battalion was attacked by a battalion of panzer grenadiers supported by two tank platoons from the 12th SS. In fierce fighting, the Germans were hit hard by machine gun fire, but managed to break through. McKinley’s men followed the tanks toward Rocherath and hunted them down with bazookas in the thick mist. As the German infantry advanced they were cut down by artillery. Robertson had given McKinley’s battalion priority of fire. He had four battalions of division artillery and three V Corps battalions at his disposal. The artillery would eventually win the night. It was a harbinger of things to come. That evening, the fighting raged in both villages. It was a house to house, street by street melee. Buildings burned, vehicles smoldered and dead soldiers littered the streets. German tanks prowled the villages, while bazooka teams hunted them down. Artillery boomed and small arms fire cracked incessantly. In Krinkelt, a German attack to capture the local church was beaten back by a reconnaissance company from the 644th Tank Destroyer Battalion. 99th Division columns retreated around the villages towards the Elsenborn Ridge. Amidst the chaos, soldiers fought with different units, or they fought alone. Stories of 12th SS atrocities against US soldiers circulated across the battlefield. Henceforth, 2nd Division soldiers gave no quarter to surrendering SS troops. By dawn, the 2nd Division still held both towns and the routes leading north to Wahlerscheid. The 395th Infantry secured the left flank of the 2nd Division northeast of Rocherath. Division and corps artillery was solidly in place on Elsenborn Ridge. At Losheimergraben that morning, the 1st and 3rd Battalions of the 394th were under attack again by the 48th Grenadiers. Meanwhile, the 27th Fusiliers, moving to outflank Losheimergraben, had found the seam between both battalions and were attacking through it. The 394th was in danger of being cut off. General Lauer ordered a withdrawal from Losheimergraben to Murringen, roughly four kilometers to the rear. As the 394th reestablished itself at Murringen, the 1st Battalion, 23rd Infantry was fighting off attacks by infantry at Hunningen. By mid-afternoon, the 12th Fusiliers were ordered to take Hunningen. The attackers were stopped by a hail of machine gun and artillery fire. By late afternoon, Hunningen was still in American hands. The 394th position at Murringen and the 1st Battalion, 23rd Infantry’s at nearby Hunningen had been in a precarious state all day on the 17th. Shortly after midnight on the 18th, Colonel Riley, the 394th commander, was given orders to withdraw. It would take almost two days for the regiment and its attached battalion to withdraw safely to the Elsenborn line. By nightfall on the 17th, the 26th Infantry, 1st Infantry Division was moving into defensive positions west and southwest of the 99th and 2nd Divisions. The 3rd Battalion dug in west of Wirtzfeld, while the 2nd Battalion blocked the Bullingen-Butgenbach road that eventually led to Malmedy. First Battalion was held in reserve, while artillery units immediately went into action, firing at 1st SS armor moving southwest out of Bullingen. Another day had passed with limited progress for the 1st SS Panzer Corps. Their attacks had been unorganized and fragmentary. The Germans had not done proper reconnaissance of the area and they had conducted a pursuit in the dark against what they assumed was the 99th Division. They were completely surprised by the presence of the 2nd Division in the twin villages. German intelligence had failed to identify the location of the 2nd Division, a catastrophic blunder. The 12th SS had missed another chance to outflank the 99th and 2nd Divisions and utilize the Bullingen-Butgenbach road.By nightfall, the 26th Infantry Regiment had arrived in force and Rollbahn C was now completely blocked to any further westward movement. In Hoefen, on 18 December, the 3rd Battalion, 395th Infantry fought off an attack from the 753rd Regiment, 326th Volksgrenadier Division. Many of the grenadiers were routed by fierce artillery support, but some of them still managed to find their way into Hoefen. By mid-day, 3rd Battalion had completely retaken the town and the Germans were forced to fall back. The losses were horrific for the enemy. They had incurred 554 casualties compared to 12 killed and wounded for the Americans. This failed attack stopped any further attempts by the Sixth Panzer Army to outflank V Corps to the north, control the Elsenborn-Monschau highway and move behind Elsenborn Ridge. The 326th Volksgrenadier would shift south and participate in future attempts to seize the twin villages. The 2nd Division was reorganizing the array of forces that had deployed into Krinkelt-Rocherath in the dark. The majority of the 38th Infantry was deployed in or around the twin villages. A battalion and two companies of the 9th Infantry and several platoons of the 23rd Infantry were defending there as well and in Wirtzfeld to the southwest. The withered battalions of the 393rd held the road network north of Rocherath. The infantry was supported by the 741st Tank Battalion, the 644th Tank Destroyer Battalion, a company of the 612th Tank Destroyer Battalion and a section from the 801st Tank Destroyer Battalion. The 394th Infantry continued to withdraw to Elsenborn Ridge. The Germans pressed the attack. During the night the 277th Volksgrenadier had been reinforced by a new battalion. The 12th SS was also reinforced with an assault gun battalion and another tank battalion. There were roughly 80 tanks and a dozen Jaegdpanthers (tank destroyers) in the attacking force. The 1st Battalion,, 9th Infantry was hit by a company of tanks partially concealed by a heavy blanket of fog. Once again, Colonel McKinley’s men let the tanks pass and then hunted them down with bazookas. Artillery hammered the panzers’ avenue of approach from the east. This first assault was completely stopped. When the fog lifted at around 0830, the Germans attacked the twin villages with the whole 989th Volksgrenadier Regiment, which was supported by 12th SS tanks. A six hour battle developed in which Germans were able to reach Rocherath, where there was heavy fighting. Colonel McKinley’s battalion was finally able to withdraw to Krinkelt, where they took up positions in a hotel. On the northeast fringes of Rocherath, Colonel Allen’s 3rd Battalion, 393rd, already at half strength, was attacked by German infantry and by tanks. Allen’s men continued to fight, but were soon overrun by the German armor and forced to withdraw to positions 1000 yards to the northwest. The German infantry and armor pushing into Rocherath was forced out within hours. The enemy regrouped and attacked the 2nd Battalion, 38th Infantry which now blocked the eastern entrance to the town. These attacks were also unsuccessful. Fierce fighting again raged in Krinkelt. 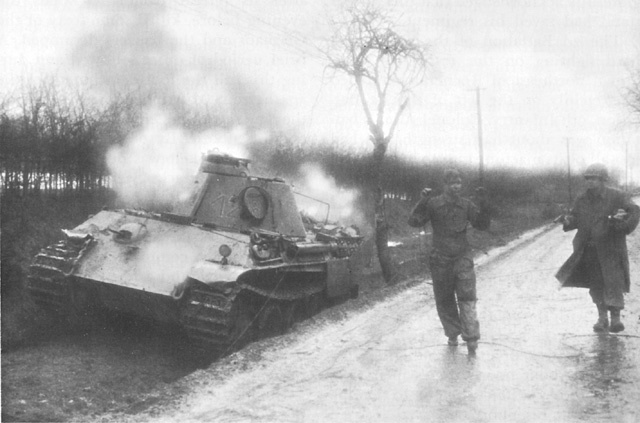 German infantry were destroyed by repeated artillery volleys, but German tanks managed to break into the village. They were devastated by tanks, tank destroyers, anti-tank mines and bazookas. The narrow, winding streets of the twin villages had become a graveyard for the Tigers and Panthers. By night of the 18th, the 2nd Division still held Krinkelt-Rocherath. The Germans probed the villages with panzerfaust teams in search of American tanks and tank destroyers that had decimated the day’s attacks. During the night, the twin villages blazed with the eerie orange glow of burning armor. General Dietrich, under pressure from higher headquarters, instructed the 1st SS Panzer Corps to halt the futile head on assaults against the twin villages. An alternate plan was developed: elements of the 12th SS would withdraw from the twin village sector, join a kampfgruppe from the 12th Volksgrenadier Division and begin moving southwest to hit the 26th Infantry defending around Butgenbach. The 3rd Panzer Grenadier Division would relieve the 12th SS and continue the attack to seize the twin villages with the remaining forces from the 277th Volksgrenadier. The main German armored thrust would come on the southern flank. On 19 December, the 2nd Division forces were ordered to slowly withdraw from Krinkelt-Rocherath. At sunrise, the Germans attacked the twin villages again, and were met with another powerful artillery bombardment. The attack fizzled out, but the Germans quickly realized that the Americans were withdrawing. By mid-morning, with heavy fog rolling in, the Germans began to slowly infiltrate men and vehicles into the twin villages. German artillery fired at the receding US force. In Bullingen on the night of 18 -19 December, a large German force assembled for an attack on Butgenbach and the 26th Infantry. 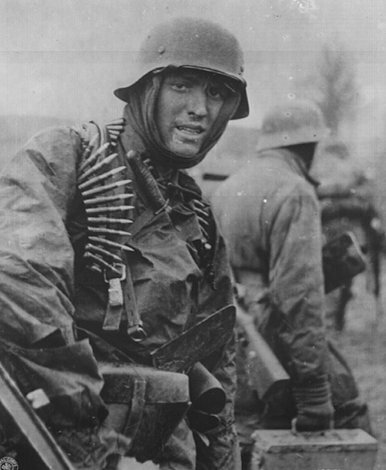 The German force consisted of the 25th SS Panzer Grenadier Regiment, reconnaissance elements from the 12th SS, an attached regiment from the 3rd Parachute Division and the 27th Fusilier Regiment. As forbidding as this force sounded, it was not at full strength. At 0230 hours, US forward observers spotted German infantrymen west of Bullingen and called in artillery on their position. This attack was quickly broken up. The Germans attacked again at 1000 with a reinforced company. This attack was also stopped. By nightfall on 19 December, the 16th Infantry, 1st Division moved into positions on the right flank of the 26th Infantry. In Bullingen, the Germans reformed for another attack the next morning. 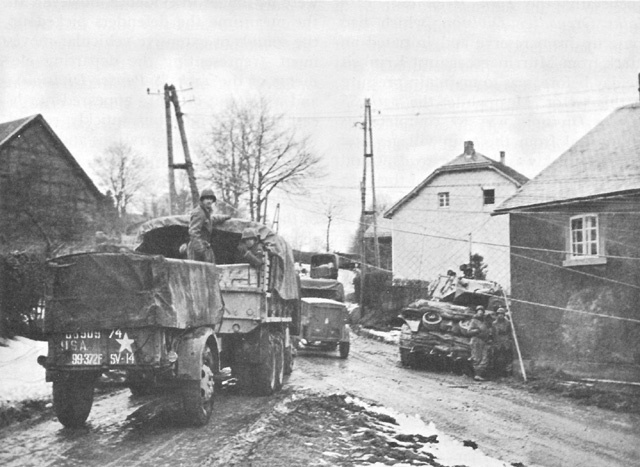 On the night of 19-20 December, a battle group from the 12th SS and a regiment from the 12th Volksgrenadier began to move toward Butgenbach. The first attack was broken up by anti-tank gunners and artillery. The Germans fell back, and then reformed at dawn for another attack which was again devastated by anti-tank guns, artillery and bazooka teams. The 99th Infantry Division, defending new positions along the Elsenborn line, fought off repeated attacks by the 3rd Panzer Grenadier Division. A combination of good ground with ample fields of fire and overwhelming fire support decimated the Germans. 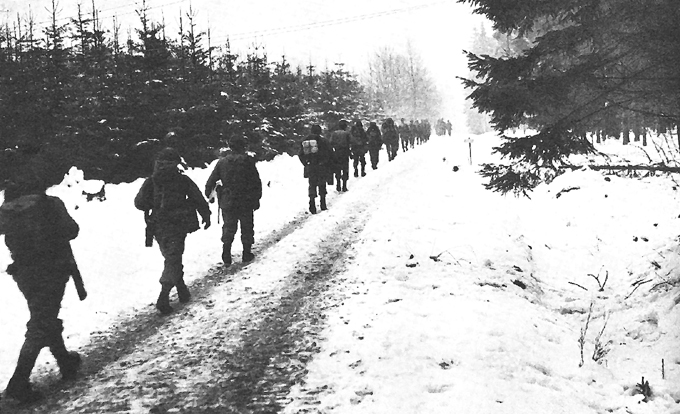 By the 23rd of December, the 18th Infantry, 1st Division was set to the rear and the right of the 26th Infantry. Rollbahn C was officially blocked. General Gerow’s V Corps had four divisions defending on good ground from Monschau to Weismes. The main effort of Wacht am Rhein would switch to the center and von Manteuffel’s Fifth Panzer Army. The Sixth Panzer Army would be forced to push the bulk of their armored forces to the south, on roads already flowing with traffic from the Fifth Panzer Army. The Germans would make two more attempts to seize Elsenborn Ridge and the road through Butgenbach, on 26 and 28 December. Both attempts failed miserably, primarily because of the 348 V Corps artillery pieces that could range any target on the battlefield. Ambrose, Stephen. Citizen Soldiers, The US Army from the Normandy Beaches to the Bulge to the Surrender of Germany: NY, NY: Simon and Schuster, 1997. Bradley, Omar N., General. A Soldier’s Story: NY, NY: Modern Library, 1999. 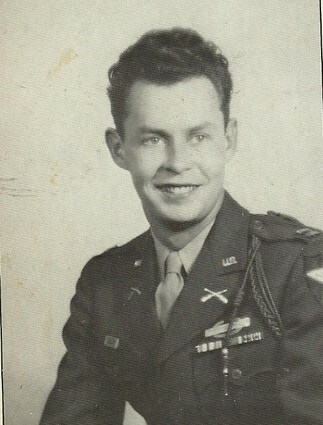 Cavanaugh, William C.C. Krinkelt-Rocherath, The Battle for the Twin Villages: Hanover, MA: Christopher Publishing House, 1986. Cole, Hugh M. The Ardennes: The Battle of the Bulge: Washington, DC: Office of the Chief for Military History, 1965. Eisenhower, Dwight D., General. 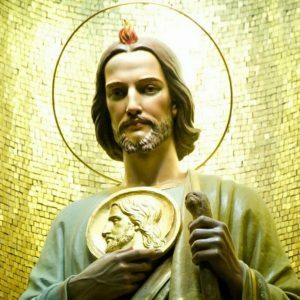 Crusade in Europe: NY, NY: Doubleday, 1948. Eisenhower, John S.D. The Bitter Woods: NY, NY: Da Capo Press, 1969. Kershaw, Alex. The Longest Winter, The Battle of the Bulge and the Epic Story of WWII’s Most Decorated Platoon: NY, NY: Da Capo Press, 2005. Macdonald, Charles B. 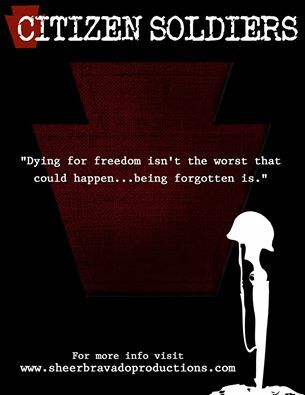 A Time for Trumpets, The Untold Story of the Battle of the Bulge: NY, NY: William Morrow, 1985. Macdonald, Charles B. Company Commander: NY, NY: Bantam, 1978. Macdonald, Charles B. The Mighty Endeavor, American Armed Forces in the European Theater in World War II: NY, NY: Oxford University Press, 1969. Macdonald, Charles B. The Siegfried Line Campaign: Washington, DC: Office of the Chief for Military History, 1963. McManus, John C. Alamo in the Ardennes: Hoboken, NJ: John Wiley & Sons, 2007. Merriam, Robert E. Dark December, The Full Account of the Battle of the Bulge: Yardley, PA: Westholme Publishing, 2011. Skorzeny, Otto. Skorzeny’s Special Missions: The Memoirs of Hitler’s Most Daring Commando: Minneapolis, MN: Zenith Press, 2011. Toland, John. Battle – The Story of the Bulge: NY, NY: Random House, 1959. US Army, “The Fight for the Twin Villages, Krinkelt-Rocherath, Belguim,16-20 December 1944” (paper given to US Army officers as part of Officer Professional Development, EUCOM, 2005). An article comparing the performance of the 99th and 106th ID would be revealing. Why did one formation collapse while the other performed well? On the other hand most of the German Volksgrenadier units were exceptionally varied in thier capabilities. The 12th was exceptional while others were close to recruits. An examination of these German units would also be helpful as well as a comparison between US replacement policies and those of the Germans. The fact that the Germans could mount such an offensive at this stage of the war is incredible. Furthermore they came closer than is generally is acknowledged to reaching the Meuse, although the offensive’s goals were a pipe dream. It is interesting to seculate what a smaller and more limited offensive might have achieved.